A doctor has appeared in court charged with 118 sexual offences. Manish Shah, 47, of Brunel Close, Romford, is accused of sexually assaulting 54 people at a medical practice in Havering, east London, between June 2004 and July 2013. He is charged with 65 counts of assault by penetration, 52 counts of sexual assault, and one count of sexual assault on a child under 13. 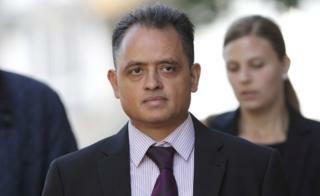 Dr Shah was granted conditional bail at Barkingside Magistrates' Court. He is due to appear at Snaresbrook Crown Court on 27 September. As part of his bail conditions Dr Shah is not allowed to attend his former surgery in Havering, or contact any current or former patients or staff. An investigation was launched into the doctor after several people went to police in July and August 2013. Dr Shah, a family planning specialist, trained at St Bartholomew's Hospital in London, qualifying in 1993. He was until recently listed as working in a limited capacity at a GP surgery in Southend-on-Sea, Essex. None of the alleged offences relate to his time at the Southend practice.